4 Vote for _______ for Secretary because life is too short to have bad student government. 6 Be a Smarty, Vote for (name). 11 My name is _____ and Im here to serve you. Vote for me and I wont desert you. 12 Counselor pick classes, Parents pick rules, Thank goodness we pick the secretary of this school. 14 Life is to short to make a mess, vote (name) for the best. 15 (Name) is the one. He knows how to get things done! 16 Keep calm an carry on, oh and vote for(name) to be secretary. 18 Two, four, six, eight! Vote for (Name), dont be late. 19 Monkey see, monkey do, Im voting for me and so should you! 20 Pack of Pencils $5, Class t-shirts $15, Notebook $3, Having (name) as secretary...Priceless. 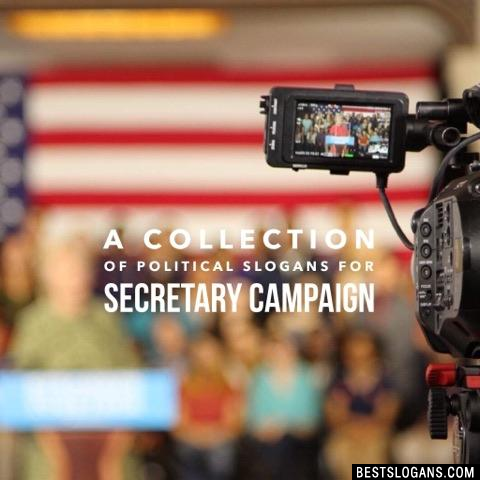 Can you think of a good Secretary Campaign Slogans we're missing? Or come up with a clever one of your own. Please share below.